Published by Edition Svitzer. Released in 2014. Find more information & purchase it here or at Lone Star Percussion. Set includes two score to perform from. 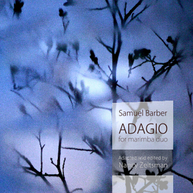 Based on the second movement of Barber's String Quartet, Op.11 (marked "Molto adagio"), Zeltsman adapted this for marimba duo (one low-E and one low-C marimba). She recorded it with Jack Van Geem on their duo CD, Pedro and Olga Learn to Dance. Watch a performance by two of Nancy's students.